The upcoming new year is the perfect time to polish the image of your brand. The upcoming new year is the perfect time to polish the image of your brand. From the look of your building to the design of your logo, January is an excellent month for making improvements for your business. One such improvement that is especially beneficial to your brand is investing in new employee uniforms for your restaurant this year. 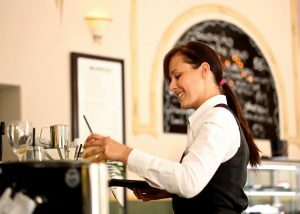 As you consider your options for new employee uniforms, consider the many benefits of new uniforms for your restaurant employees in 2019. Showcase the professionalism of your brand with uniforms that are colorful, clean, and distinct to start the new year. With the right uniforms to professionally display your beautiful logo, both you and your employees can proudly provide excellent service to your customers while representing your business. Create a uniform appearance of your staff in 2019 by ensuring that everyone has access to brand new uniforms for the year. While employee uniforms are important for maintaining the professional appearance of your brand, they are also crucial for promoting hygiene in your restaurant. A clean uniform is an essential part of presenting each member of your team with a clean and polished appearance, as well as ensuring the hygienic preparation of food in your facility. By demonstrating that you value a hygienic presence for your employees, you are showing your customers that you care about the cleanliness of each process in your service. A distinctive uniform for your employees will also help to distinguish your employees from customers in your restaurant clearly. Not only will this help to create a unique look for your team, but it will also contribute to better service for your customers. If your customers are unable to find help quickly when they need it, they are less likely to return to your restaurant and more likely to leave an unfavorable review of your business as well. For over forty years, Lord Baltimore has provided cost-effective towel rental services throughout the East Coast, including Maryland, Washington DC, Northern Virginia, Southern Pennsylvania, and Delaware. To learn more about how new uniforms can keep your brand and business looking great, please contact Joe Bateman at Lord Baltimore by calling 800-292-1224 or visit LordBaltimoreUniform.com. We also handle uniform and mat rentals and purchase for restaurants. Additionally, we also sell and rent uniforms, shop towels, fender covers and mats for manufacturing and automotive industries. This entry was posted on Friday, January 4th, 2019	at 10:26 am	. You can follow any responses to this entry through the RSS 2.0	feed. Both comments and pings are currently closed.